All the buildup, excitement, planning, time away from work, family gatherings, gifts exchanged, and holidays celebrated is just about over. And as we prepare to flip the calendar to another year and head back to work, to school, and to real life, many of us wrestle with the question: So, now what? A woman with nine and a half decades of experience gave me some sage advice at our family Christmas Eve celebration a couple years ago, and today, I'm going to share it with all of you. Are We Racing and Missing the Gifts Right in Front of Us? Every year, my parents host as many of their children, daughters and sons-in-law, grandchildren, and dear friends as find themselves in town. In the midst of the chaos two years ago, the matriarch of the family, my 96-year-old grandmother Caddy and I stepped into a quiet room and had a wonderful conversation. Caddy is an amazing woman. She drinks from the fountain of youth, always wears a smile, and strives to put a smile on the face of anyone with whom she's speaking. Grandma Caddy's short-term memory is fading a bit, but her zest for life and natural beauty remain perfectly intact. During our conversation I asked about her childhood, how she met my grandpa, what it was like during World War II when he was in the Pacific, what life was like raising kids during the 50s, and a few of her favorite memories. I then asked what advice she’d give me as I continued along this path in life. How Can You Embrace Grandma Caddy's Advice? 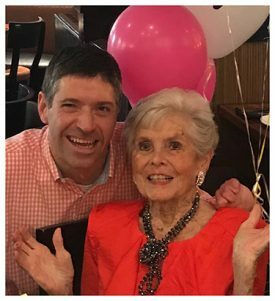 Caddy's 96 of years of raising kids and losing friends, savoring mighty blessings and minor gifts, learning through mistakes, and living life has taught her what matters most. She knows that the success so many of us long for is illusive until we slow down long enough to notice the joys that are already ours to celebrate. My friends, as we step into a new year, with new goals, new resolutions, new opportunities and new uncertainties, I encourage you to embrace the sage advice of Caddy to slow down and take an inventory of the blessings in your life. Take account of the lessons you’ve learned, the adventures you’ve experienced, the wisdom you’ve received, the life you’ve lived and the possibility before you. Because it's not only the scenery you miss by going fast. You're also likely to miss the sense of where you are going and why you were going there in the first place. The post Slow Down and Enjoy Life appeared first on John O'Leary.